Two great charitable organizations are holding Wine Trail Rides in May with proceeds benefitting worthy causes. Hotel Dieu Grace Hospital will be kicking off the Wine Trail Ride season with a ride on May 22nd. We will be visiting Aleksander Estate Winery, Black Bear Farms Estate and Pelee Island Winery. Tickets are $55 and include guided tour, all tastings, tours and a fabulous meal made with Essex County products. The Hôtel-Dieu Grace Hospital Foundation was created to help Hôtel-Dieu Grace Hospital provide high-quality and compassionate care to its patients and their families. Formally launched in the fall of 2005, as the Heart of the City Hospital Foundation, their mission is to support Hôtel-Dieu Grace Hospital by funding priority capital and equipment needs. In 2008, the Foundation changed its name to Hôtel-Dieu Grace Hospital Foundation to honour and better reflect the century-long tradition of Hôtel-Dieu and the Salvation Army Grace Hospitals’ caring for the community. 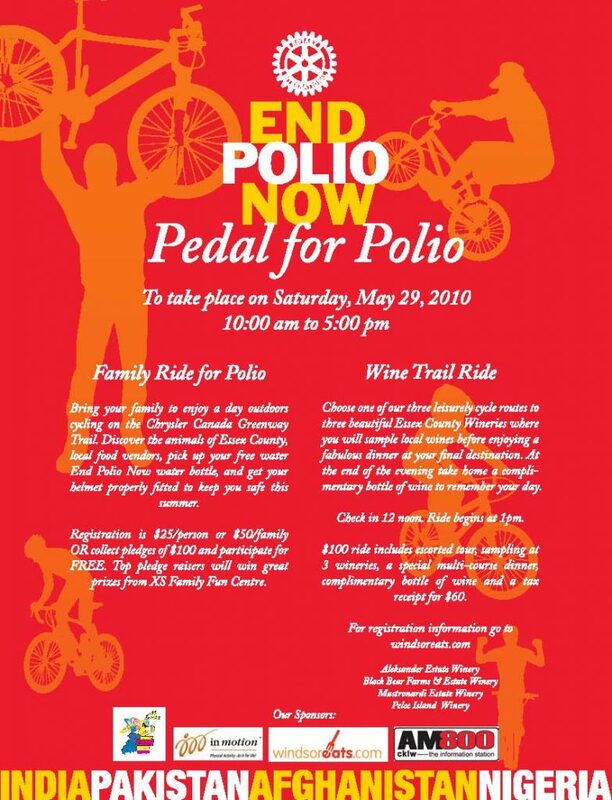 On May 29th it’s the Pedal for Polio Wine Trail Ride hosted by the Rotary Club of Windsor. This Wine Trail Ride is part of a group of activities happening on the same day. Tickets are $75 per person and include a guided tour to 3 wineries, all tastings, tours and an amped up meal prepared by Mark Muzzin of County Connect. Pedal for Polio is multi-faceted event to raise funds for the eradication of polio in the world. The event will include a family ride on the Chrysler Canada Greenway where families and individuals can enjoy a leisurely cycle on the Greenway, take in some special events along the trail and support polio efforts at the same time. Special prizes will be awarded to the top three individuals/families with the most pledges. In the fall, we will continue our efforts with a cycling challenge around Essex County. Both of these events benefit organizations that do great things in our community. If you enjoy the Wine Trail Rides, come out to one or even both of these events and contribute to a great cause. Tickets for both of these events can be purchased through the WindsorEats.com shop.